Dr. Maxwell Maltz is the author of Psycho-Cybernetics. Ironically he began as a plastic surgeon. 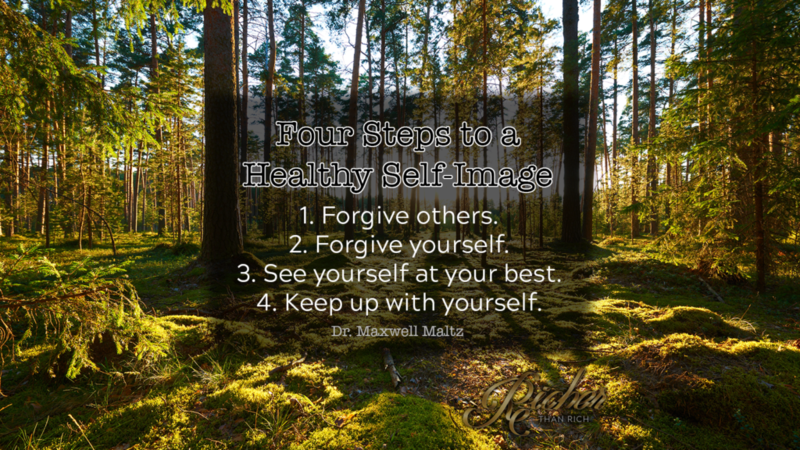 He presents four steps to constantly practice in order to develop a new habit of a healthy self-image. If you are not successful, it is because you do not believe you are or should be successful. Holding onto resentment and anger only hurts yourself. Let it go. Forgive EVERYONE for EVERYTHING. Do this for yourself and expect nothing in return. Forget your regrets, failures, humiliations. Let it go. Love yourself and forgive yourself. See yourself at your best. Replace any image of doubt with an image of yourself being successful. Ignore everyone else. Forget what they have, what successes or failures they are experiencing. Grow and become successful for your own self-fulfillment and joy. Do what you want to do!